My Occasional Blog: Happy New Year! 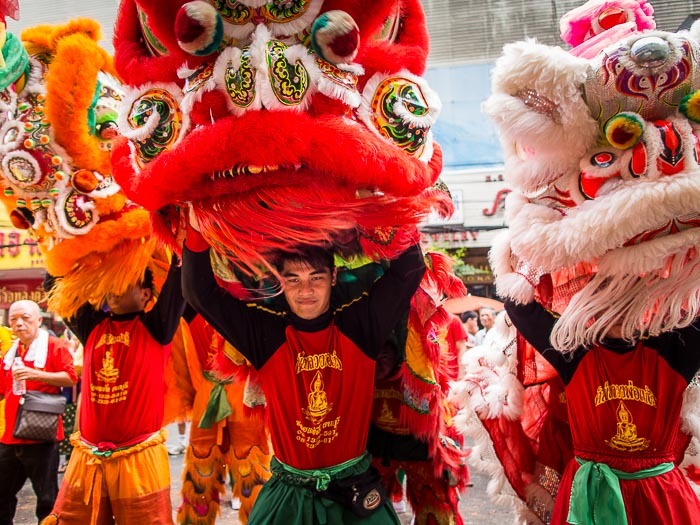 Lion dancers on Yaowarat Road in Bangkok's Chinatown. Thailand has the privilege of celebrating New Year's Day three times in four months. There's the Gregorian New Year of January 1, which is Thailand's official new year and celebrated in the usual ways: fireworks, music, alcohol and parties. People watch lion dancers on Yaowarat Road. Second up is Lunar New Year, also called Tet or Chinese New Year. 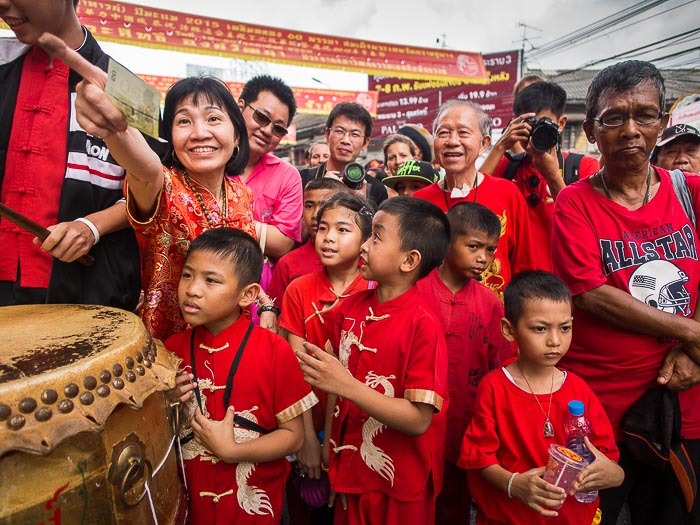 About 14% of Thais are ethnically Chinese and Chinese culture has influenced Thai culture. Lunar New Year is a huge party in communities with a significant Chinese population. Bangkok has a huge Chinese population and celebrates the New Year with a lot of zest. This year is the Year of the Goat, the eighth cycle in the Chinese zodiac. 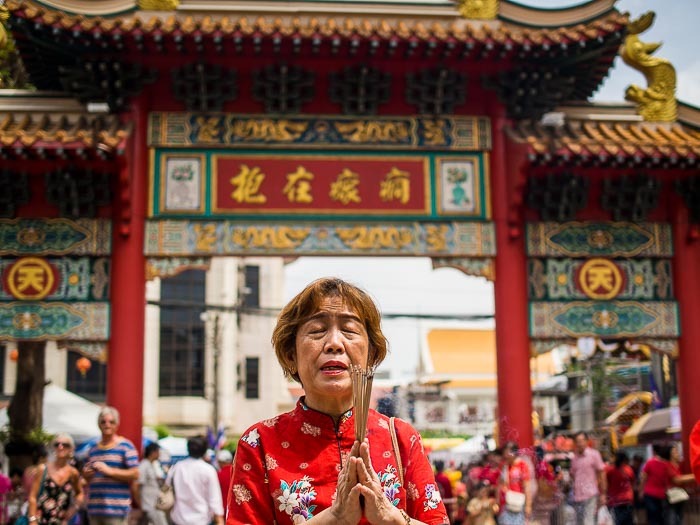 A woman prays at a shrine on Yaowarat Road. Yaowarat Road is the heart of Bangkok's Chinatown. Food stalls line the road, dragon and lion dance troupes go up and down Yaowarat visiting businesses whose owners pay them to perform for the gods and ensure a prosperous new year. A woman reacts to a dragon dance troupe parading past a restaurant in Chinatown. Next up on Thailand's celebrations of the New Year is Songkran, also called the "Water Festival" and the traditional Thai New Year. It's in mid April, the heart of Thailand's scorching summer, and features community wide water fights. 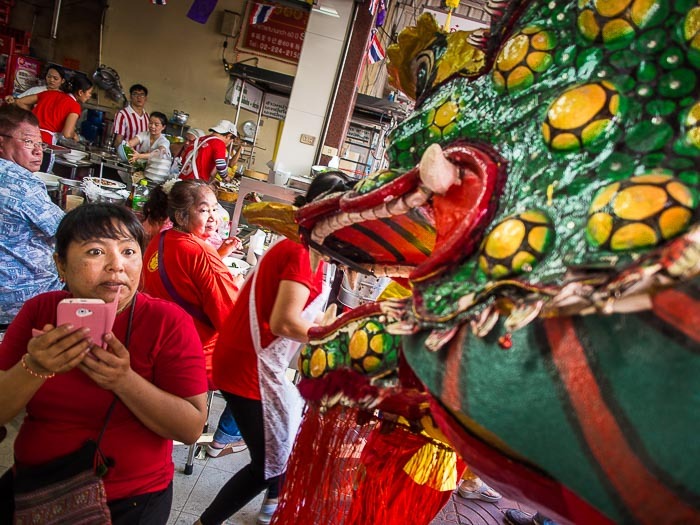 There are more photos of Bangkok's Lunar New Year observances in my archive or available from ZUMA Press.